Isaac Vega is a strong, proud, independent woman that don't need no man. He has an unhealthy addiction to Anime and has been black listed by Square-Enix due to his obsessive fascination with Final Fantasy. After being introduced to Plaid Hat Games, by his overly intrusive mother back in 2010, Colby has taken this budding designer under his wing and propelled Isaac into the wonderful world of board games. Although he still considers himself somewhat of a noob, Isaac just can't stop designing prototypes. 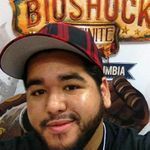 With five games already released and a plethora of others in development, Isaac Vega is truly becoming a force to be reckoned with.